Banana Republic has also created a travel essentials range, which will be available to Virgin America flyers for a limited time via the airline’s Red in-flight entertainment system Shop platform and in select Banana Republic stores from August 7, 2012. The range includes aviator sunglasses, classic trenches for men and women, a leather tote and men’s messenger bag. 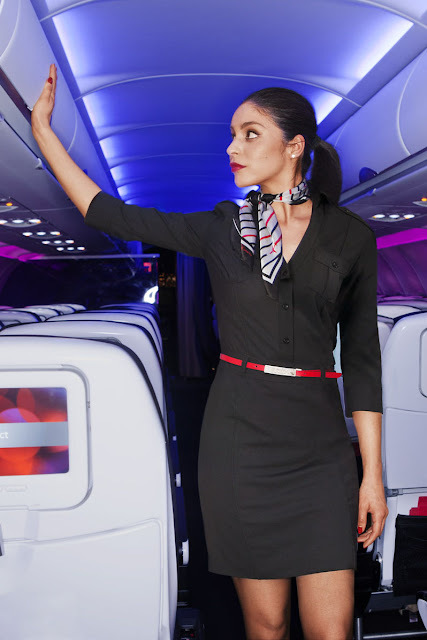 “In creating the uniform designs for Virgin America, we wanted to respect the heritage of in-flight uniform design while injecting a modern twist that’s both functional and fashionable,” said Banana Republic Creative Director and Executive Vice President, Simon Kneen. It took 18 month for Banana Republic to develop the uniform. Part of this was an internal ‘Design Challenge,’ in which Banana Republic designers competed for the coveted opportunity to create the uniform design. Previously, Virgin America and Banana Republic have collaborated on creation of the first live-tweeted in-flight fashion show last year and in-flight makeovers at 35,000 feet in 2010. In 2011, Virgin America also partnered with Google to let its passengers discover Chromebook.